Eleanor Salvio, 98, of New Britain, Conn., passed away Sunday, Aug. 26, 2018, at Amberwoods of Farmington, surrounded by her loving family. 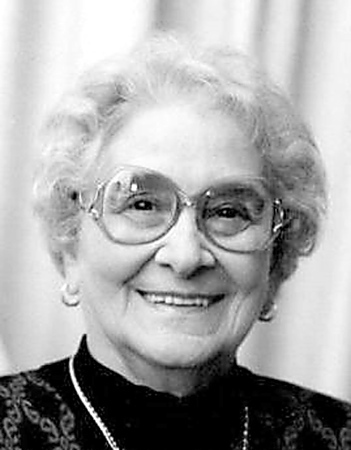 Eleanor was born in Riverton, Vt., on Jan. 12, 1920, and was the daughter of the late Martino and Giovannina (Berini) Borella. In her youth, she was a star basketball player and a wonderful dancer. Eleanor was very proud of that and talked about it often. She made many trips to beaches up and down the East Coast from Maine to Florida with her family, and a very special trip to Reno, Nev., with her sisters, having a wonderful time. Eleanor worked for many years at Fafnir Bearing Company in New Britain, retiring in 1982, and was a member of the Fafnir Seniors. She was a member of St. Ann’s Church and a member of the Ladies Guild there. Eleanor is survived by her loving and devoted daughters, Carol Salvio of New Britain, Conn., with whom she made her home, and Jane Giannini and her husband, Vito of Plainville, Conn., her grandchildren, Kristin Craig and her husband, Justin of Burlington, Conn., and Michael Giannini and his wife, Sharon of Plainville, Conn. She was especially proud of her great-grandchildren, Evan and Elena Giannini and Ryan and Katelyn Craig, all of whom brought a wonderful smile to her face each time she was with them. Eleanor is also survived by her two sisters, Catherine Pettengill and Elsie Benson both of Vermont, and her sister-in-law, Frances Salvio of Farmington, Conn., and many, many nieces and nephews. Eleanor was predeceased by her husband, Louis Salvio, in 1989, her sister, Josephine Coccoluto and her three brothers, John, Dante and Aldo Borella. The family would like to thank her many special caregivers at Amberwoods in Farmington, and Masonicare Hospice for their kindness and caring during her short stay there. We would also like to thank her special friend, Kim Harvey, who spent much time visiting with her and talking to Eleanor about her life and experiences in Vermont as a youngster. Funeral rites for Eleanor will be held Friday, Aug. 31, 2018, at 9:30 a.m. with the procession departing at 10 a.m. from the Paul A. Shaker Funeral Home, 764 Farmington Ave., New Britain, Conn., followed by a Liturgy of Christian Burial at 11 a.m. at St. Ann Church, 101 North St., New Britain, Conn. Committal service and final resting place will be in St. Mary Cemetery, 1141 Stanley St., New Britain, Conn. Relatives and friends may call at the Paul A. Shaker Funeral Home, Thursday from 5 - 7 p.m. Directions to the funeral home - I-84 east or west, exit 37 (Fienemann Rd) - right off exit - one mile down on right. Posted in New Britain Herald, on Tuesday, 28 August 2018 19:20. Updated: Tuesday, 28 August 2018 19:23.